A British Unitarian in New Zealand. A Vision Splendid by Wayne Facer was released at an invitational and public book launch party on 24th March 2018. 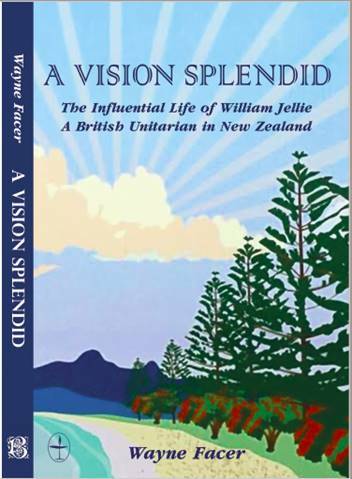 This fascinating biography of William Jellie, a pioneering Unitarian minister and educator and a key figure in the history of Unitarianism in New Zealand, is a once in a lifetime publication. This book is essential reading for anyone who has an interest in New Zealand’s early history, Unitarianism, trade unionism, workers’ education and the fight for secular education. In a world where religion is increasingly associated with hatred, bigotry, fanaticism, violence and misogyny, Jellie’s story provides an alternative – a vision splendid – where values rooted in the liberal religious tradition are the very ones helpful in promoting social justice, protecting the powerless and reducing social and economic inequality. It is a story we can turn to for inspiration as we continue to work for fairness in society, equality of opportunity, and the enrichment of the human spirit. Peter Lineham, Professor of History, Massey University, introduced the book.